Salvation And Survival: Unholy Alliance? Have you asked yourself why the Pope is so eager to combine his considerable influence with the United Nation's efforts to sell the concept of climate change to the world? Does it make you a little nervous to hear that the Secretary-General of the UN, Ban Ki-Moon, spoke at the Vatican Climate Conference? (Sorry, but those words just don't go together.) When asked about those in the Catholic community who have reservations about the Pope's position on climate change, Ban replied, "I don’t think faith leaders should be scientists. I’m not a scientist. What I want is their moral authority. Business leaders and all civil society are on board [with the mission to combat climate change]. Now we want faith leaders. Then we can make it happen." My first thought is, Make what happen? First of all, what is Pope Francis's position on climate change? From what I can glean from other sources, he has preached about the need to protect the earth and all of creation as part of a broad message on the environment. He has also made statements on environmental degradation and the effects of human-caused climate change on the poor. 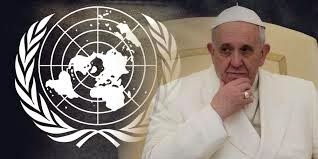 And let's face it, it's pretty smart of the UN to use the authority of the Pope to convince the 1,200,000,000 (that's 1.2 billion) Catholics in the world that their fears about global warming coincide with Church doctrine to help the poor, be good stewards of the earth, etc. See how easily the climate change doctrine could become an actual article of the Catholic faith? Now, I must admit that my views on climate change are rather simplistic ... there is most likely a greenhouse effect on the earth that carbon dioxide contributes to, and results in a measure of warming. But I also submit to the idea that perhaps this is how God designed this planet; He is Sovereign and All-Knowing and I have a pretty good idea the ups and downs of climate change through the centuries are no surprise to Him. Furthermore, I believe that the NWO Elites saw a "cause" in which they could appeal to the fears and altruistic tendencies of the common man in return for great political and economic gain. They took an idea with a grain of truth to it and expanded it into a billion dollar enterprise that affords them a great opportunity to control the masses. But here is the deal ... Is it really the business of the Pope to stray from the field of faith and morals and wander into the playground that is science; especially when so many of the theories and "scientific data" have been refuted? The Pope declares that climate change affects the poverty-stricken of the world, right? But one of the greatest friends of poor people around the world – an estimated 1.3 billion people who lack running water and electricity — is carbon based fuels. The Vatican and the Pope should be arguing that fossil fuels are the ‘moral choice’ for the developing world for people who don’t have these amenities. Instead, he is aligning himself with the NWO and Environmentalists to promote energy policies that aren't really in the best interest of the poor. I also find it interesting that this Pope is much different than his predecessor. Pope Benedict suggested that fears over man-made emissions melting the ice caps and causing a wave of unprecedented disasters were nothing more than scare-mongering. He said that while some concerns may be valid it was vital that the international community based its policies on science rather than the dogma of the environmentalist movement. Could that be why we saw his abrupt and somewhat surprising resignation? I'm sorry, but I can't help but feel that Pope Francis is entering an unholy alliance. Climate change policies will not help the poor of the world, or developing nations. There is a hidden agenda and I can't quite see what the final outcome will be. Is the Pope being used? Or is he a willing accomplice? Whichever it is, I am uneasy about a highly influential religious leader combining forces with the UN, which represents "a system" whose soul purpose seems to be to control the lives of all mankind. Wait a minute ... haven't I heard that somewhere else? Daniel 4:30 "And the king answered and said, “Is not this great Babylon, which I have built by my mighty power as a royal residence and for the glory of my majesty?" Yes, Belle, it is a dangerous proposition. It is called Agenda 21.